This one’s for the apartment-dwellers out there! If you’ve got limited living space but love gardening, we hope you learn about some handy new tricks in this post. 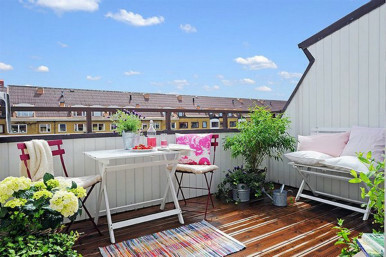 Apartment living often means compromising outdoor living space for great location. 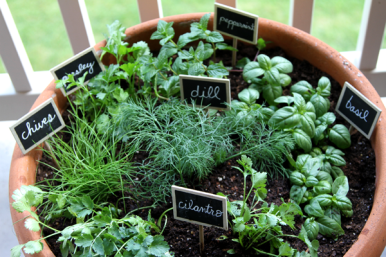 Backyards and gardens are hard to come by when living in an apartment, and therefore growing your own herbs and vegetables may seem impossible. But we’re here to tell you that having a patio garden is not only easy to do but can actually give you a decent harvest! Creating small gardens that can sit atop a window sill or live in various containers is a great way to bring greenery into your home and to take your green thumb for a test drive. As an added bonus, planting in containers that are small and portable also allows you to move plants indoors and outdoors, depending on the season. Most vegetable plants require quite a bit of sunlight, and those that need full sunlight should be getting at least six hours of sunshine per day. This means that these plants should be put on patios or, in the winter, indoors in front of windows that get full sun exposure all day. Even plants that do not require full sunshine will still need some sun exposure. A few things to be cautious of are drafts and cold-leaking single pane windows. Either of those on their own can kill plants, so both at the same time are especially dangerous. If you have a window with a ledge that gets sun exposure, a planter box with various herbs and ‘container approved’ vegetables may be the perfect thing for you. If there’s an area in your home that can accommodate larger containers, you can likely grow more hearty vegetables such as small tomatoes, peas, zucchini, and beans. Herbs of all kinds are easily grown indoors and in small containers. These include chives, parsley, cilantro, mint, and many more. Herbs are a great way to add some green to small spaces and also provide ready to eat flavour at your fingertips. 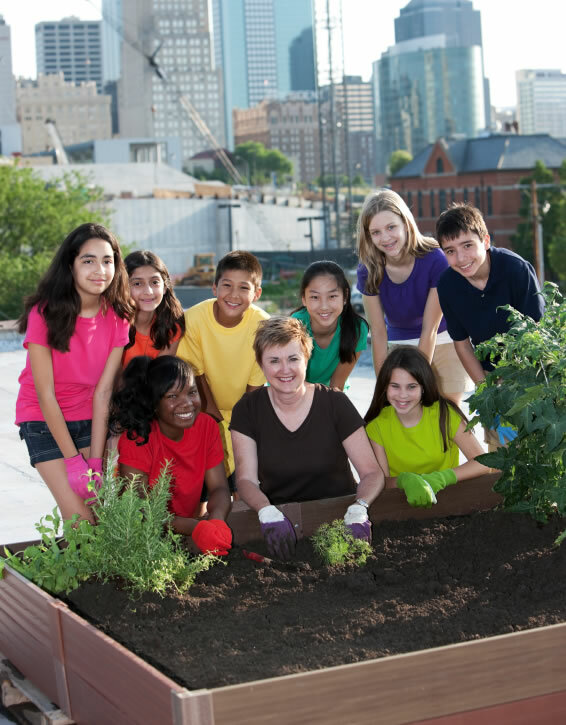 Many vegetables come in patio varieties, meaning they are meant to be grown in containers as opposed to a full garden. Often these kinds of vegetables will be labelled and include tomatoes, zucchini, peppers, and cucumber. The key to picking the right plants is in the roots. Vegetables that require a large root system, such as carrots, do not do as well in confining containers. Lettuce, spinach, and radicchio are other examples. For leafy greens, choose varieties which will grow back after harvesting so that your garden can continue to flourish. Lettuce is a great choice to plant in the fall as it does well in cooler temperatures, so pay attention to the best time of year for planting. Don’t be afraid to put more than one plant into one container either. Depending on the planting instructions given, many herbs and vegetables are happy to grow next to one another in decent sized containers. This not only gives variety to your apartment garden but also fills out containers, making them look more interesting and lush. The beauty of apartment gardens is that you can use whatever containers you please and then choose the plants best suited to the container size. Herbs are happy to grow in teeny tiny places such as mason jars, tea cups, small terracotta pots, and the like. 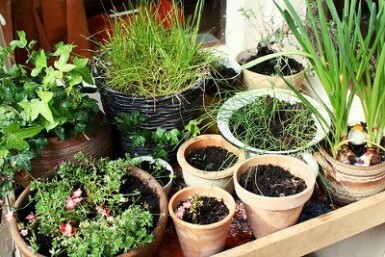 Or you can put multiple herb plants in one container and fill out a larger space. Various kinds of lettuce can be grown in containers as small as six to twelve inches across, while vegetables like zucchini and tomatoes will need larger containers of about five gallon capacities. These containers do not have to be traditional pots, so old wash basins, small barrels, and other creative containers can bring an interesting aspect to your garden. Keep in mind that containers should have drainage holes at the bottom to ensure that the plants are not sitting in stagnant water too long. Specific planting and care instructions can usually be found on then labels attached to plants when purchased. In general, you will know you need to water your plants when the leaves start to look wilted and when you stick your finger about an inch into the soil without feeling any moisture. When watering, be sure to only wet the soil, not the leaves of the plant, and water until liquid reaches the rim of the container. Then allow it to drain, best done where water is not damaging to floors or fabrics. Do the same once more to ensure the soil is properly moistened. Be sure not to over water or allow plants to sit in puddles of water as this can kill them. Adding a balanced fertilizer is important in container gardening. Over time, watering results in the soil’s nutrients being drained away. Fertilizer helps to replace lost nutrients and keep your veggies happy and healthy. There are two kinds of fertilizer, both of which are great to use in your apartment garden. There are liquid fertilizers, which are added to water, and slow-release fertilizers which are added to the soil and release small amounts of nutrients each time you water your plants. For herb and vegetable plants, fertilizers that are high in phosphorus but low in nitrogen are best. If you’ve already got a bit of a green thumb and want to try some new tactics out, have you heard of windowfarms and permaculture? 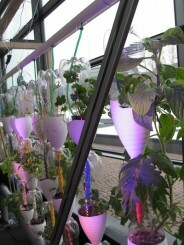 These are super simple hydroponic setups that enable people to grow numerous types of plants in relatively small spaces. You can make or buy all the components yourself, and be up and running in no time. Since the entire setup is controlled by a pump, all you need to do is add more water when the reservoir gets low, and add liquid fertilizer at certain intervals. You can put this setup in windows, doorways, along walls, or even inside of windowless rooms if you have the right lights. If you want to learn more you can check out the WindowFarms website, where you can learn all about how other people have made their own mini farms. To make things even more exciting, our last stop in the world of indoor gardening is aquaponics. This is some pretty exciting stuff because it combines aquatic creatures and farming, all in the same system. The basics, which you can see in the video below, are that when you combine either fish, crayfish, snails, or other aquatic animals, with your hydroponic plant setup, you can make wonderful things happen. Now, it’s not very likely that you’ll fit one of these large systems in an apartment, but it is possible to scale things down somewhat. In fact, you can find a way to combine aquaponics and windowfarms to make a beautiful and functional aquarium/garden combination. Now that you have the basics needed to start your apartment garden, it’s all about experimenting with different containers and plants to see which will flourish in your home. Starting with easy to grow vegetables and working your way up to more difficult techniques will help you to grow a hobby that is both rewarding and delicious. Happy gardening!